Paula Shoyer's Chocolate Meringue Cake. © "The Kosher Baker" by Paula Shoyer (Brandeis University Press, 2010), used with permission. 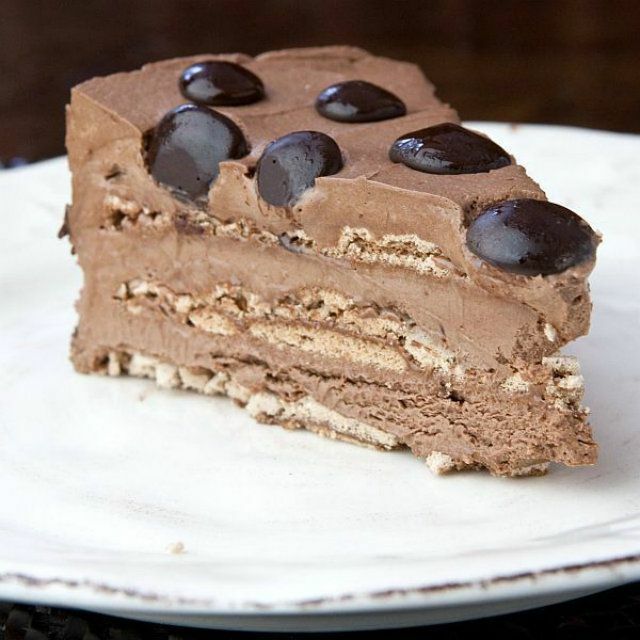 This recipe for Chocolate Mousse Meringue Layer Cake is from Paula Shoyer's "The Kosher Baker" (Brandeis University Press, 2010). It's a parve dessert, which means it's a neutral food, that can be eaten with a meat meal because it is nondairy, things which must be kept separate when keeping kosher. It can also be eaten for Passover since no flour is involved. But disavow yourself of any notion that parve means tasteless. Shoyer is a professional pastry chef trained in the preparation of classic French pastries. She translates these techniques into desserts that, allergies notwithstanding, anyone can enjoy! Heat the oven to 230 degrees (to dry out meringue, it needs to be baked slowly at low heat). Line a large cookie sheet with parchment paper. Using an 8 x 2 1/2-inch-high dessert ring (or the ring from an 8-inch springform pan) as a guide, trace 3 circles on the parchment. It's OK if the circles touch each other but don't let them overlap. If necessary, use 2 cookie sheets. Turn the paper over and place on the cookie sheet(s). In a small bowl, sift the confectioners’ sugar and cocoa together. In the bowl of a stand mixer, or in a mixing bowl with a hand-held mixer, beat the egg whites on medium-high speed until they start to stiffen. Turn the mixer to low and add the granulated sugar gradually, and then beat another minute on high speed until the whites are stiff. Sift the confectioners’ sugar and cocoa a second time into the bowl with the egg whites. Beat on low until just combined. Fill a pastry bag fitted with a 1/4-inch round tip with the meringue batter. Starting from the center of the circles drawn on the parchment, squeeze out spirals until your circle is about 1/2 inch smaller than the drawn circle. Use the back of a spoon to smooth over the "holes." If you don't have a pastry bag, use a silicone spatula to shape 3 circles of meringue batter. Use any leftover meringue batter to make decorative shapes such as kisses, letters, lines, or hearts, if you like. Place in the oven and bake for 2 hours. Turn off the oven and let the meringues remain in the oven another 2 hours so they can dry out. Melt 7 ounces chopped bittersweet chocolate either on the stovetop or in the microwave. Heat 1/4 cup of the whipping cream and 1 tablespoon sugar in a small saucepan over medium heat, stirring often, until the sugar melts and the cream starts to boil. You can also heat the cream and sugar in the microwave in a glass measuring cup until the sugar is dissolved, about 1 minute. Don’t worry if the cream starts to look gloppy. In a large bowl, with an electric mixer on high speed, beat the remaining 1 3/4 cups whipping cream until it is just whipped. Don't overwhip. Fold the whipped cream into the chocolate mixture until well blended. Use a purchased or homemade 8-inch cardboard cake circle as a base. To build the cake, line a clean cookie sheet with parchment paper and place the 8-inch cake ring or 8-inch springform cake ring on top. Place the cardboard cake circle into the ring. Place a tablespoon of the mousse on the cardboard to help glue the meringue circle in place. Place one of the meringue circles in the ring. Pour a third of the mousse into the ring to cover the meringue. Make sure you get some mousse between the meringue and the ring on the sides. Add the second meringue circle and another 1/3 of the mousse. Repeat with the last circle and more mousse and then smooth the top, reserving any extra mousse in a small bowl stored in the refrigerator to decorate the top, if desired. Place cake into the freezer for 4 hours or overnight. Remove from the freezer. To remove the cake ring or springform ring, place the cake (with the cardboard bottom) on top of a large can of tomatoes or vegetables. Place boiling water in a small bowl. Take a towel or paper towel, dip it into the hot water, and then rub around the outside of the ring. This will help release the ring from the mousse. Gently slide the ring down off the cake. Place the cake back on the parchment-lined cookie sheet. Use the extra meringue pieces you made or melt some chocolate chips and drizzle it over the top of the cake. Store the cake in the freezer and remove it 30 minutes before serving to cut perfect slices. Store in the freezer for up to three months.